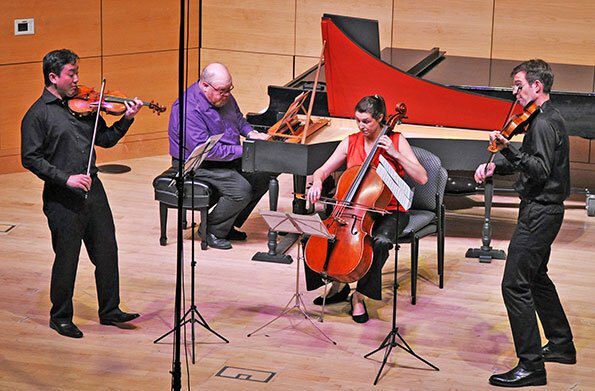 Works of two old-comers and one newcomer concluded the season for the Portland Chamber Music Festival Saturday at the University of Southern Maine’s Abromson Center. The latter, Josh Newton, is a Massachusetts native and Maine resident who won the Festival’s seventh annual composition competition (the first Mainer to do so); the former were Vivaldi and Brahms. It’s getting a little more common these days to hear Vivaldi’s chamber music, but it’s hardly ubiquitous. Haydn quartets are often relegated to the role of opener, but in this case, the first piece was the Trio Sonata in G Minor, RV 73, published as Vivaldi’s Op. 1 No. 1, for two violins (Frank Huang and Jesse Mills) and continuo (Claire Bryant, cello and Peter Sykes, harpsichord, the latter reading his part from a paper copy rather than a tablet, as he did Thursday). In five brief movements (the slow ones acting more as introductions to the peppy ones following), the violins took great advantage of Vivaldi’s alternating lines, deftly tossing the lead to one another, while the continuo was very well realized and considerably more involved than just filling out the bass line and harmonies—Bryant was clearly part of the ensemble with the violins, with an adroitly expressed melodic contribution. This ensemble ran movements 4 (a capriccio) and 5 (a gavotte) so closely together that one could mistake them as two parts of a single movement, though no “attacca” was indicated in the score. Apart from that, there were no grounds for cavil at the performance. The work of Josh Newton, who splits his time between composing, performing and computer programming, was unknown to us before Saturday. His Twenty-Three Skiddoo for clarinet, viola and piano (Todd Palmer, Dov Scheindlin and Rieko Aizawa, respectively) is a short scherzo-like movement (he said from the stage that he contemplated adding other movements) that reminded us a bit of MIT neo-tonalist Elena Ruehr. The jokey title refers to the rhythmic, melodic and harmonic interactions between two and three; while Newton averred that the contemporary trend for silly names was not his norm, a quick perusal of his website doesn’t show anything even remotely like “sonata for x and y.” Be that as it may, the piece features a perky-jerky tune stated first by clarinet and tossed about with the viola. The piano lays down a groove to which the others add staccato and legato riffs—requiring, we observed, a lot of heavy-duty counting by the players. At one point, the clarinet taunts the viola with a descending minor second phrase, and the piano is called in to mediate the dispute. All in all, a charming piece expertly performed. The concert and festival came to an end with Brahms’s glorious String Sextet No. 2 in G Major, Op. 36. G major is a key Brahms used quite sparingly—a quick review of his catalogue discloses only three large-scale works in this key, being this sextet, the first violin sonata, op 78, and the second string quintet, op. 111. The first two of these are characterized by an effusion of Romantic smiling through tears and an unhurried introspection. In the case of the sextet, the source of these emotions is completely clear: Brahms himself acknowledged that he was seeking to expiate his having wronged his fiancée Agathe von Siebold by getting cold feet and calling it off (the “frei aber einsam” of the F-A-E Sonata wasn’t just a catchphrase for Brahms). The second theme of the first movement literally spells it out, rendering “Agathe” (or as close as he could get, which was “Agadhe”) in notational nomenclature. 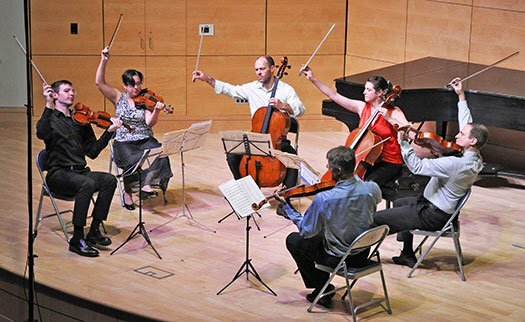 The ensemble performing it Saturday consisted of Mills and Jennifer Elowitch, violins, Jonathan Bagg and Scheindlin, violas and Bryant and Brant Taylor, cellos. After a bit of hesitancy and possibly some intonational uncertainty at the beginning, they settled down at an appropriately relaxed pace, bringing out the music’s intimate conversational tone. The second movement scherzo was treated with admirable delicacy in the outer sections (Mills and Bagg were quite impressive in their spot-on unisons), contrasting delightfully with the robust ruggedness of the trio. The slow movement began with a bit of uncertainty over who had the leading voice, with Mills and Bagg covering Elowitch’s lyric line, but things eventually resolved into a limpid outer section framing an intense, impassioned central one and ending with an air of ambiguity and questioning. The finale was both dancing and glowing as all put out their most gorgeous and sumptuous sonorities.